What a throw by Brady, hitting Gronk for a big gain. As @Globethurston just said, "Look at that clydesdale!" Multiple runs of 10+ yards for Brady in one postseason? Going out on a limb and saying this is a first. 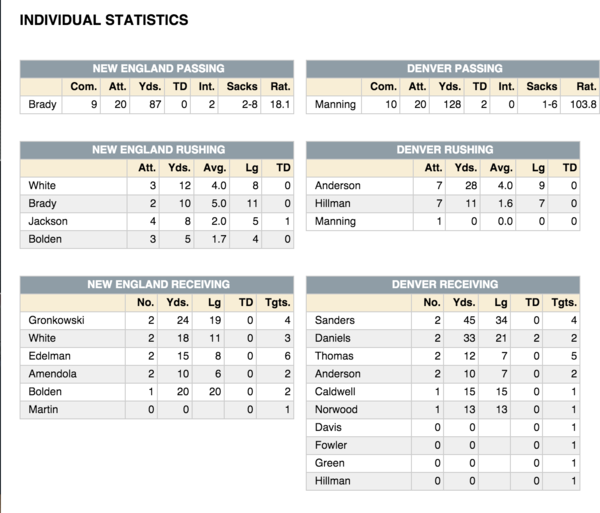 Gostkowski GOOD from 46 makes it Broncos 14, Patriots 9. This run by Brady is, so far, the longest run of the game. That was a 6:44, 13-play drive. Don't believe I've ever seen or heard that penalty called in a game before. The Brady/Belichick Patriots are 4-4 when trailing at the half in the playoffs. Won twice last year (Ravens, Seahawks) when doing so. If Edelman doesn't make that tackle, Stewart takes it to the house. Brady's QB rating to this point is 21.1. Patriots' offensive line obviously having a mess of a game. Just as obviously, road is a way more difficult place for O-line communication. #Broncos have 1:52 and 1 timeout yet. And get the ball to start the second half. Why didn't the #Patriots defer??? Brady is 9 of 20 for 87 yards with two interceptions this half. Manning starts this drive 8 of 16 for 114 yards and two TDs. Patriots' playoff record when Brady throws for 2+ INTs: 4-3. His worst rating in a playoff win: 57.5 (2011 AFC championship vs Ravens). Good coverage by Logan Ryan to force this incompletion. 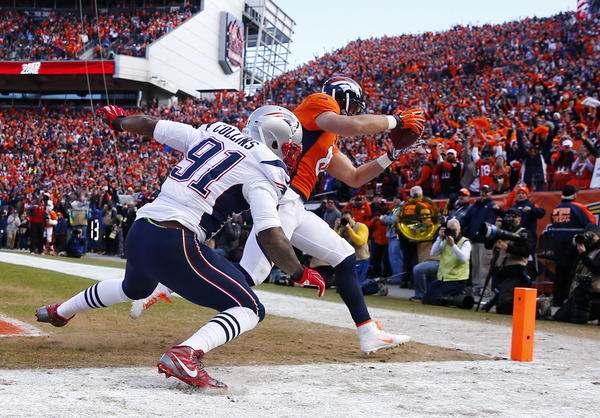 HALF: Broncos 17, Patriots 9. Broncos will receive to start the second half. 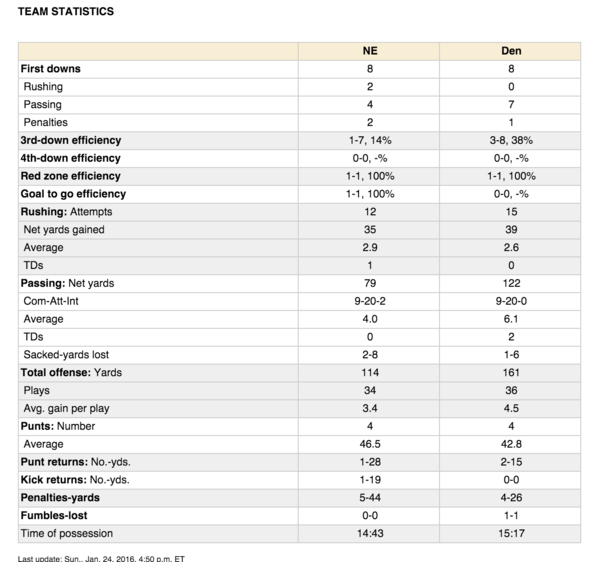 Not much went right the first 30 minutes for the Patriots. Credit Denver's D. In 6 quarters this season vs. Broncos, Patriots' TD drives were 3 short fields (47, 15, 22) and a 63-yard pass to Bolden. Dating to SB XLII, Patriots are 2-5 in playoff games where Brady's been sacked 2+ times. Amendola flexing that left knee after being tackled on that punt return.